We Christians find bright rays of hope even in the midst of our darkest times. We believe that death is not only an end, but also a beginning. Our loved one has passed from this present, temporary life to a perfect, permanent one. He or she who knew God in faith on earth now sees the Lord face-to-face in heaven. While death separates us, we will one day be reunited with all those we love in a “dwelling provided for us by God, a dwelling in the heavens, not made by hands but to last forever” (2 Corinthians 5:1). We understand that right now you likely feel confused, sad, stunned, or perhaps even overwhelmed by your loss. In the past you have loved others, comforted them, and shared their losses. During the hours and days just ahead it will be your turn – your time to be loved, to be comforted, and to let others help you bear the pain of your grief. St. Mary’s Basilica is here for you and your family. 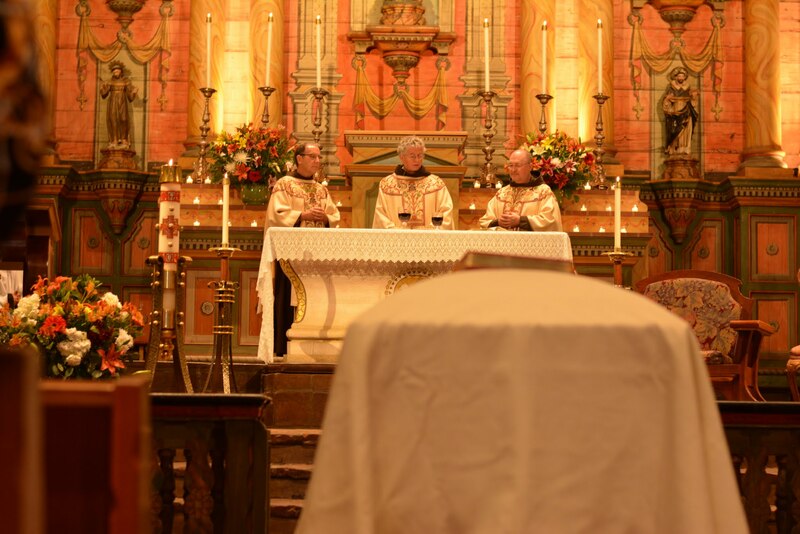 When a Catholic dies, the Church celebrates a particular set of liturgical rites to help us through the immediate days of our grieving, to express our belief in eternal life, and to help us pray for the one who has died. 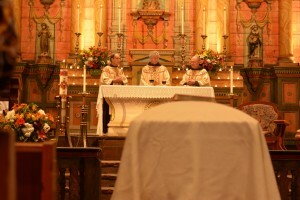 These rites are organized into what is called the Order of Christian Funerals, which contains all the liturgical prayers, scripture readings, and blessing for use immediately following the death of a member of the Church. The funeral is the central service within the Order of Christian Funerals and should be a source of great comfort to all who gather for it. Planning it alongside our priests or his delegate can help you better express your love for the one who has died, your own profound sorrow, and your faith in our kind and merciful God who promises us eternal life. To begin the process for planning the funeral service your first step should be to contact your mortuary upon the death of your loved one. If you need assistance in selecting a mortuary or cemetery we recommend visiting Whitney & Murphy Funeral Home, which is familiar with planning Catholic funeral services at St. Mary’s Basilica. Your mortuary will then contact St. Mary’s Basilica to confirm a date and time for the service. After being contacted by the mortuary, St. Mary’s Basilica, will contact you and your family to make arrangement to meet with our priest and music director to begin planning the liturgical services. The following guidelines have been created to assist families in planning a funeral at St. Mary’s Basilica.